Web search firm Google - whose motto is "don't be evil" - is setting up a subsidiary dedicated to doing good. 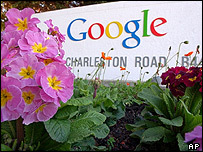 Its new philanthropic division, named Google.org, will fund social investment projects in the developing world. Founders Larry Page and Sergey Brin are devoting 1% of Google's stock and profits - almost $1bn (£573m) - to the new charitable venture. The first beneficiaries include projects to improve water supplies in rural Africa and anti-poverty works. The charity is the outcome of a pledge made by the California-based company at the time of its initial stock market flotation last year. Mr Page and Mr Brin said they would set up a Google Foundation to do "good things for the world". The foundation will start with an initial endowment of about $90m (£51.5m). In addition, a further $175m will be invested outside the foundation over the next three years, with the aim of aiding "socially progressive" private companies as well as non-profit organisations. US-based organisation Technoserve will get $500,000 for a competition to find and fund business start-ups in Ghana. Google's vice-president of operations and advertising Sheryl Sandberg - who is in charge of Google.org - said the company wanted to provide sustainable solutions to the problems of poverty, energy and the environment. "It's not a lot of money in the face of the world's problems, so we want to make sure to get the most out of it," she said.